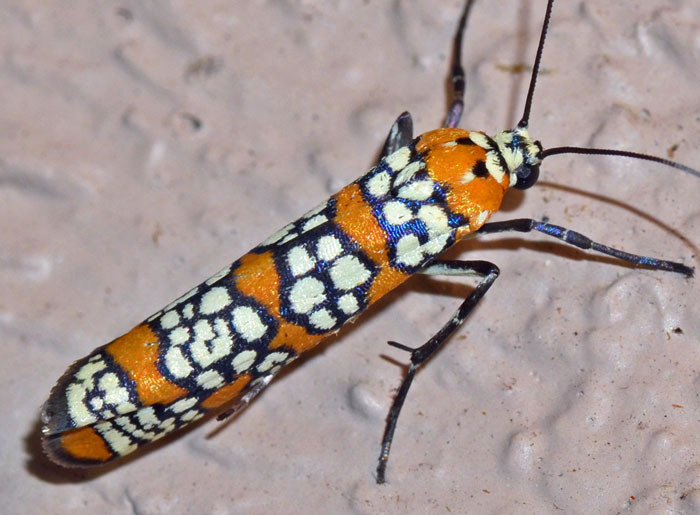 Atteva aurea - Hodges#2401 (Ailanthus Webworm Moth). What a beautiful little moth! Its forewings are orange with several large black and white rosettes. The detailed pattern apparently varies among specimens. Adults take nectar from flowers. The presence of this originally tropical moth in the eastern US is closely related to the ornamental plant Ailanthus altissima which is now considered one of the most serious weeds in the US.